One of the latest fashion discoveries is asymmetry. If you are a true fashionista, you should have at least one asymmetrical dress in your wardrobe. Since autumn is the best season to visit some exotic destinations, we thought you might need a nice dress for your holidays. However, even if you are not planning to travel abroad, you can still wear this dress in cooler weather. Combine it with a studded leather jacket and a pair of ankle biker booties, and get ready to embrace chilly autumn days in style. 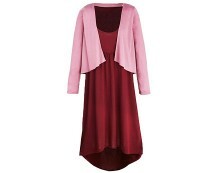 This stylish dress with dip low back hem is available in two different colours and patterns – pink and striped. 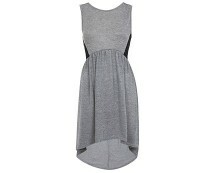 It can be purchased for £18.19 from misguided.co.uk.